Chairman of the Supervisory Board of Volkswagen AG, formulated the visionary goal of bringing to market a production car that was practical in everyday use with fuel consumption of one litre per 100 km. That decision started the saga of the Volkswagen 1-litre car. The first chapter saw the L1 prototype in 2002 registered for use on public highways; Dr Ferdinand Piëch drove it personally for a journey from Wolfsburg to Hamburg to demonstrate the feasibility of the project. 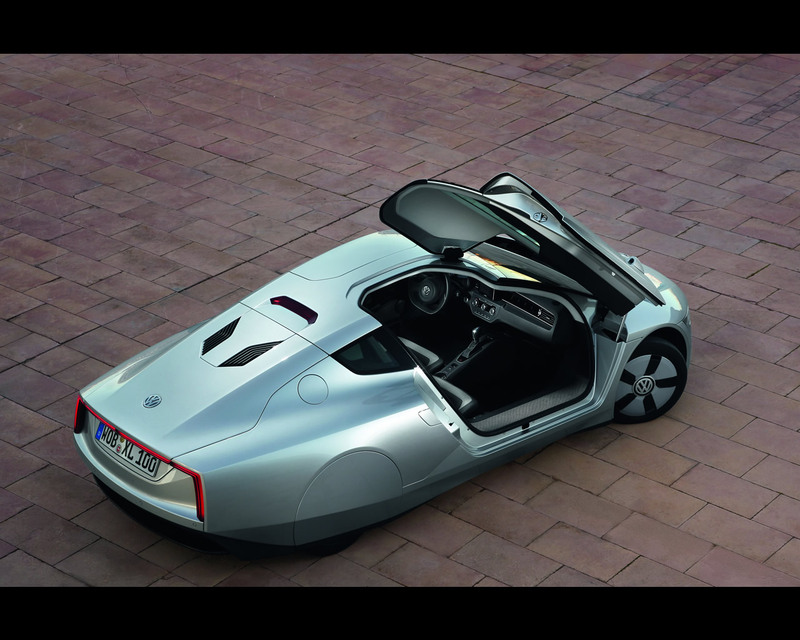 Car Reviews Volkswagen 1 Litre Concept 2002 describes the event and the vehicle. Chapter two of the saga occurred in 2009 with the introduction of the Volkswagen L1 Diesel Hybrid Concept 2009. 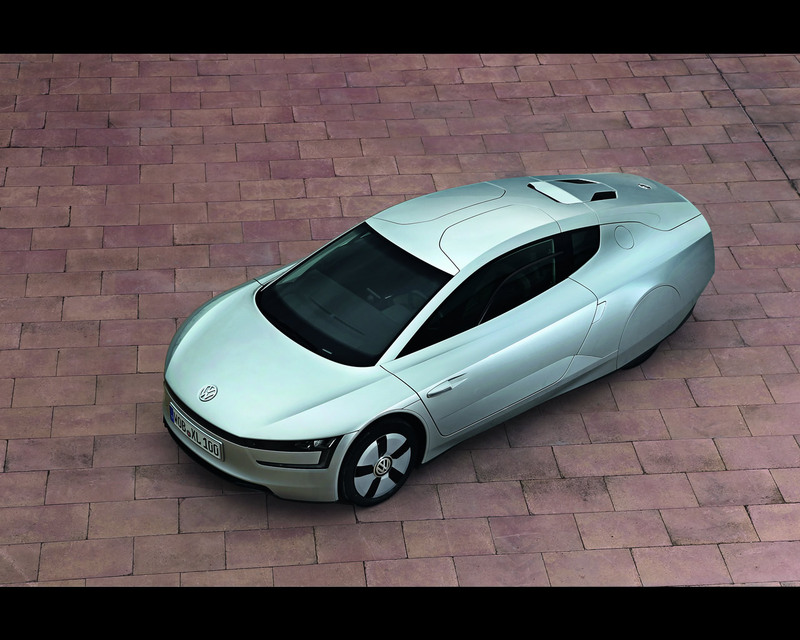 Chapter three was initiated at the 2011 Qatar Motor Show with the presentation of the Volkswagen XL1 Plug in Hybrid Prototype. Now in 2013, Volkswagen announces the development to short production run readiness at the Osnabrück plant in Germany. The XL1 is an automotile project that follows pure sports car design principles: low weight (795 kg), perfect aerodynamics (Cd 0.189) and a low centre of gravity (1,153 mm high). This gives the efficient Volkswagen the ability to cruise on the road at a constant speed of 100 km/h using just 6.2 kW/8.4 PS. In all-electric mode, the XL1 requires less than 0.1 kWh to cover a driving distance of over one kilometre. 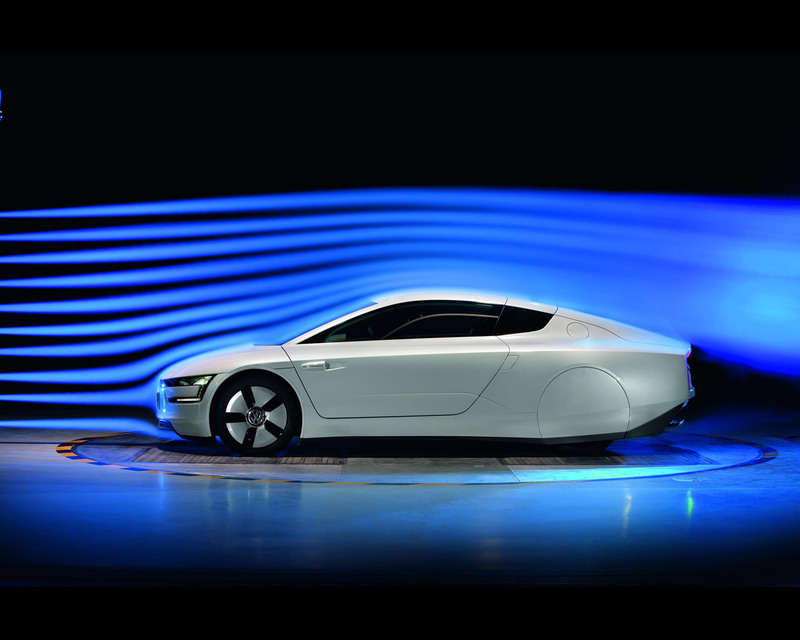 The Volkswagen XL1 is electronically limited to 160 km/h. It offers high-tech lightweight design, perfect aerodynamics and a plug-in hybrid system – consisting of a two-cylinder TDI engine (35 kW/48 PS), E-motor (20 kW/27 PS), 7-speed dual clutch gearbox (DSG) and 60 cells 5,5 kWh lithium-ion battery – all make it possible for the new Volkswagen XL1 to emit just 21 g/km of CO2. If necessary, the XL1, with a top speed of 160 km/h, can accelerate to 100 km/h in just 12.7 seconds. Clearly, 0.9 l/100 km fuel consumption is a record figure that has not been achieved by any other road legal and practical vehicle to this date. Wolfsburg, February/March 2013. 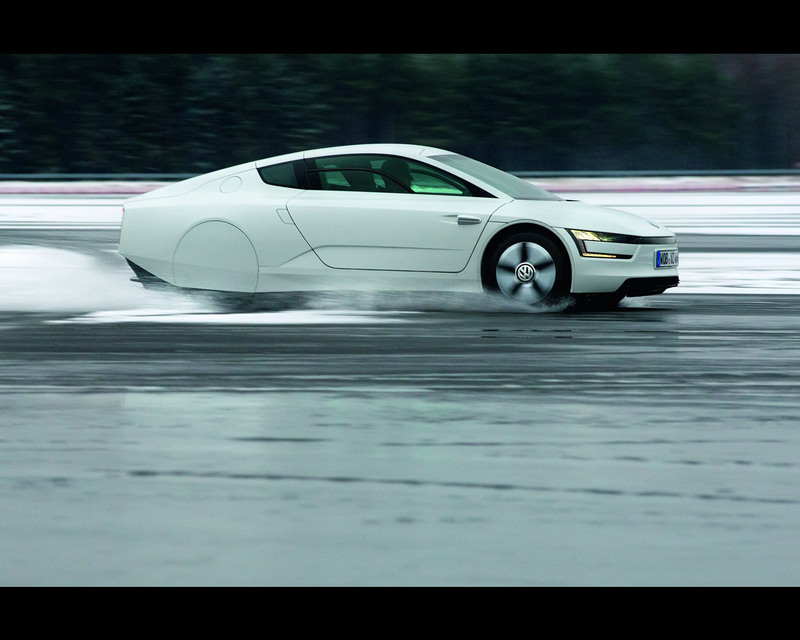 The XL1 is a car of the future that is being built today. 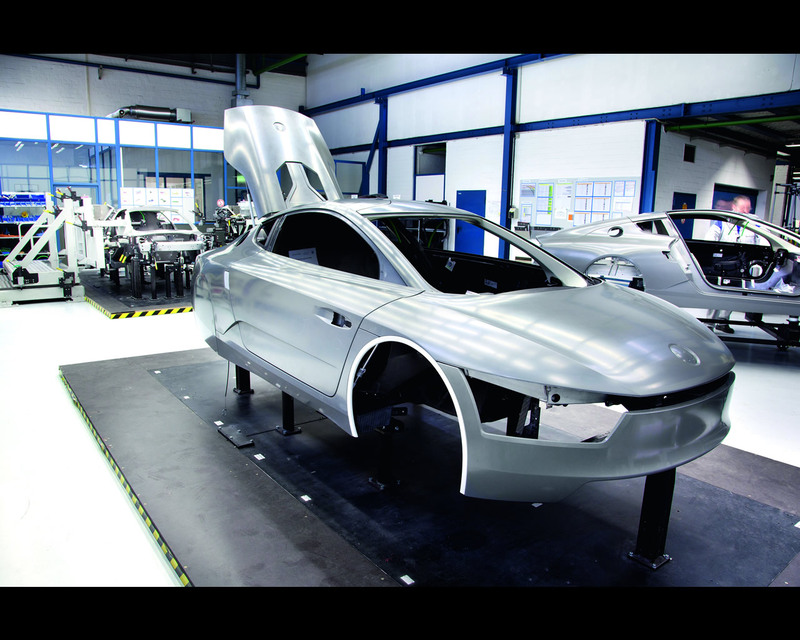 Not only are its technologies pioneering, but also the fact that Volkswagen is producing large parts of the XL1 in lightweight and strong carbon fibre reinforced polymer (CFRP). The monocoque with its slightly offset seats for driver and front passenger, all exterior body parts as well as functional elements such as the anti-roll bars are all made of CFRP. The preferred process for producing CFRP components at Volkswagen is the RTM process (Resin Transfer Moulding). The density of this material is only around 20 per cent that of a comparable steel exterior skin. The CFRP parts exhibit a level of stiffness and strength that is by no means inferior to that of comparable steel or aluminium parts, yet the exterior skin of the XL1 is just 1.2 mm thick. Compared to other methods such as manufacturing CFRP in a prepreg process, CFRP production via RTM is more economical − with lower costs at higher part volumes − because it can be automated. The RTM parts are produced in multi-shell, heated and vacuum-sealed tools. This involves injecting liquid resin at high pressure into the tool containing the semi-finished carbon material and whose interior has the shape of the part to be produced. The part cures afterwards in the mould. fibres, process materials and electronics. Thanks to CFRP, the XL1 is not only light in weight, but very safe as well. This is due in part to the high strength CFRP monocoque that is also lightweight. In a crash, it provides the necessary survival space for the driver and passenger. This is achieved by intelligent design of load paths, including the use of sandwich structures in the monocoque. In addition, the front and rear aluminium car structures absorb a large share of the crash energy. These principles were also implemented in the design of the CFRP doors, where an aluminium impact beam is used to absorb crash energy; a stiff CFRP door frame also minimises intrusions into the CFRP safety cell. Much attention was given to the rescue of occupants as well. If the XL1 is resting upside down on its roof after a rollover accident, pyrotechnic separating screws simplify opening of the doors (swing doors). The new XL1 is currently the most fuel efficient and eco-friendly automobile in the world. The only reason that this vehicle could be built is because it redefined the limits of what is feasible both in terms of the technologies it utilises and its manufacturing method. 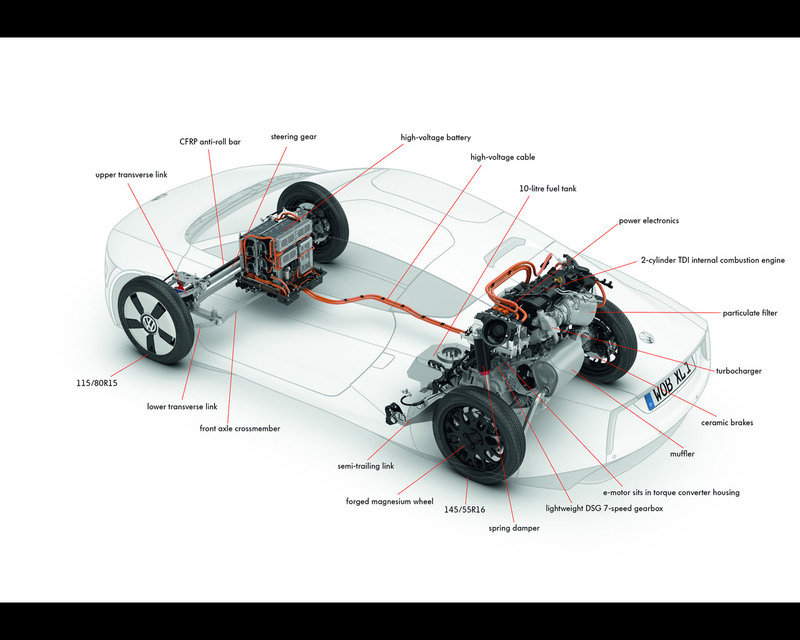 Consider XL1 technologies: Volkswagen is implementing highly innovative systems and materials that offer the highest efficiency possible today. 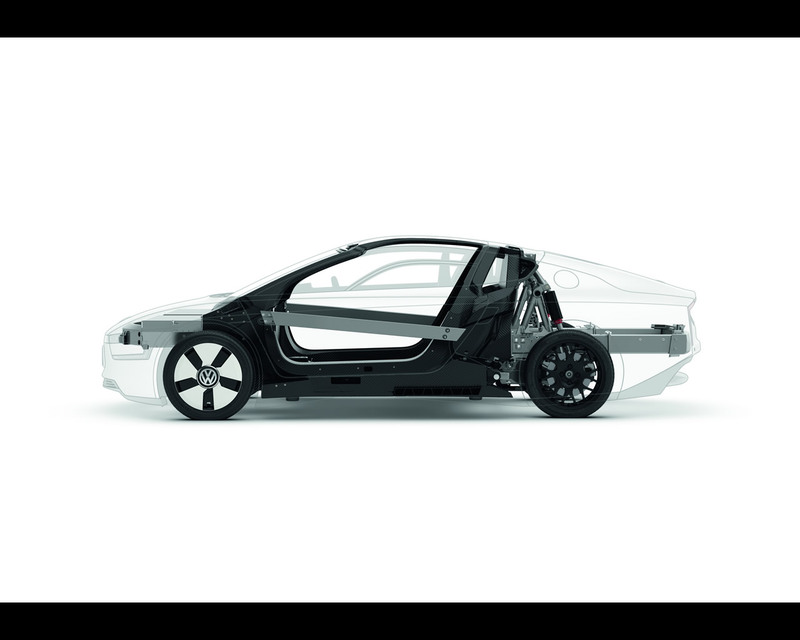 Consider XL1 manufacturing: In Northern Germany, Europe’s largest carmaker has set up a completely new handcrafting-like manufacturing for the XL1, which consists largely of CFRP. The XL1 is manufactured by Volkswagen Osnabrück GmbH. In the former Karmann plants there, around 1,800 employees produce such cars as the Golf Cabriolet and the new Porsche Boxster. Over the further course of production stage I, the boot pan is brought into position with the water channel, and it is glued and screw fastened. In addition, all structural and exterior skin parts (rear cross-members, rear termination part, side panels front and rear) are positioned and screwed via a sled fixture. Last but not least, employees check and document the dimensional tolerances of the entire assembly as the final step of every production stage. Each individual part of the XL1 is also documented with a serial number and its production history. In parallel to production stage I, the two wing doors are produced in a separate production stage, including their crash reinforcements. 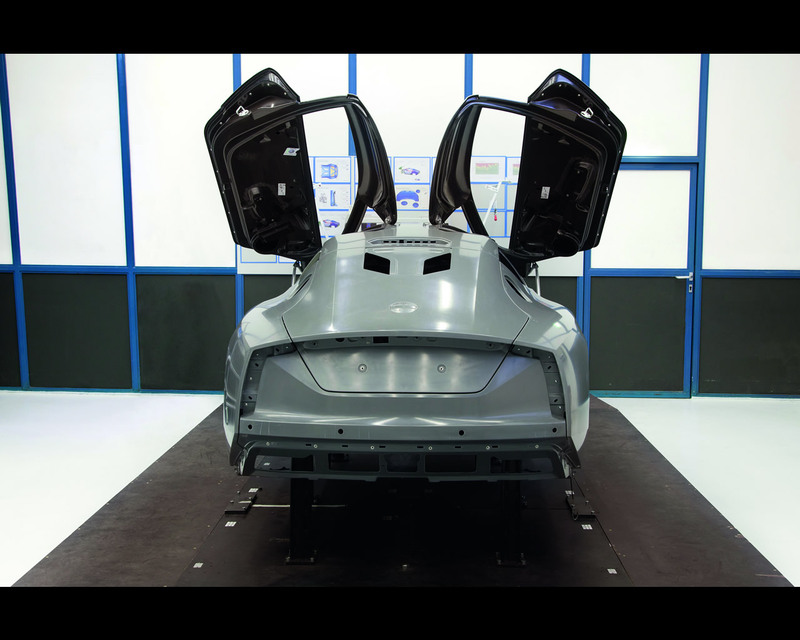 Volkswagen developed its own tool for this, which is used to fit the doors to adjoining body parts with millimetre precision to satisfy the extremely tight production tolerances – even before it is placed in the monocoque. This is the only way to assure that all requirements are fulfilled in the installed state, such as the defined joint seam dimension and uniform transitions between the surfaces. Unlike sheet metal parts, carbon elements cannot be reshaped afterwards. 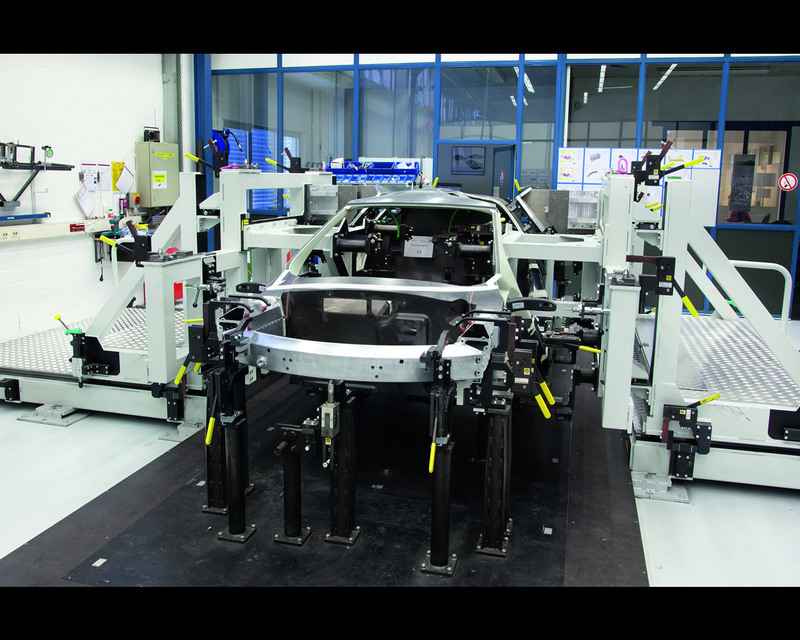 At the third production station, the bodyshell frame is placed on a new fixture. Here, all body parts are assembled to achieve the specified gap dimensions and flush mounting precisions. These parts include the wing doors, bonnet, boot lid, front bumper and various small parts. 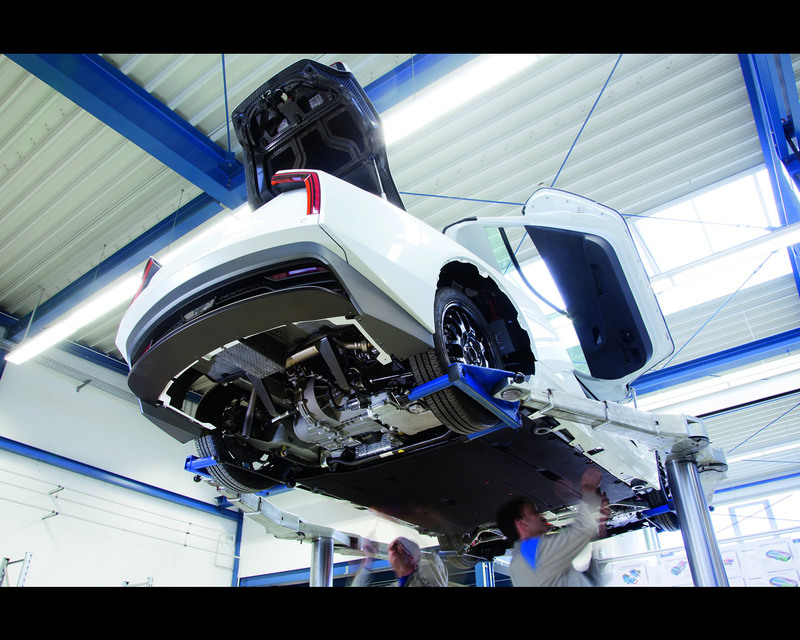 Adjustment of the wing doors is a special challenge, because a precise fit must be assured to the roof and side body surfaces. A total of 32 exterior skin parts are painted on the XL1; six of them are visible carbon parts. The CFRP parts are specially prepared for painting in the framework of XL1 production. Background: To fulfil the quality standard of a Class A paint job despite a minimally thin and therefore lightweight paint layer, in the RTM process a special fleece layer or resin film is added to the parts as a cover coat. Compared to conventional CFRP paints used in the industry, this yields a weight reduction of over 50 per cent. The paint itself consists of three layers. The primer with a filler material is followed by the base paint – the coloured layer. Then the final layer or clearcoat is applied, which provides a high level of scratch resistance and UV resistance. In the interior, on the other hand, a decorative “matt pearl grey” paint is applied, or – on visible carbon parts such as the sills – a matt clearcoat. The same applies to the roof structure on which Volkswagen omitted trim parts in the interest of attaining optimal weight and maximising open space for the occupants. Following painting, all components are transported to final assembly. The first step here is to join the front body section to the prefabricated floor pan. 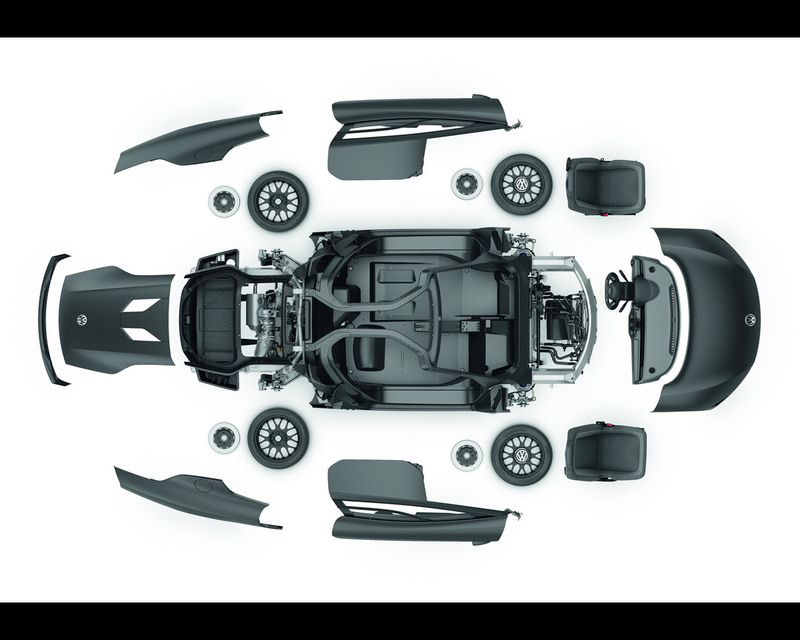 The module of this floor plan consists of components such as the double wishbone front suspension with swivel bearing (produced from die-cast aluminium), anti-roll bar (produced from CFRP), a small 12-Volt battery for the vehicle electrical system and the front ceramic brake discs. Also integrated in front is the high-voltage battery for the plug-in hybrid drive. Another special aspect is the mounting position of the air conditioner: the unit is typically mounted in the vehicle interior. For packaging reasons, however, this is not possible in the XL1. Therefore, the air conditioner is installed in a special insulated capsule in the car’s front section. Automatic testing of the vehicle’s electrical system and preliminary startup of all electronic components are also performed at the ITC (Startup and Test Centre) in this production stage. The classic merging of the drive unit with the body occurs after assembly of the front end. The entire drive unit (two-cylinder TDI engine, E-motor and 7-speed DSG) is installed in the rear section of the XL1. The rear axle produced from die-cast aluminium together with final drive shafts and ceramic brake discs, as well as the CFRP anti-roll bar, complete the components integrated at the rear. In parallel, the cockpit is installed at this station via its magnesium supports. Unlike in mass production, no provisions were made for preassembling the XL1 cockpit due to the small production volume. Instead, all individual cockpit parts are mounted inside the vehicle superstructure. The dashboard itself consists of a moulded wood fibre material, which is just 1.4 mm thick and is produced in a special pressing process. windscreen is installed, which is only 3.2 mm thick. The wing doors (including outside door mechanisms) are reinstalled; their exact positions and alignments were already set in production stage II. The bonnet is also mounted on the monocoque with centering pins. Last but least, the XL1 gets its magnesium wheels. They are fitted with low rolling resistance tyres sized 115/80 R15 (front) and 145/55 R16 (rear). The wing doors are the most complex add-on components of the XL1 body. After installing the painted door and integrating the window mechanisms, special assembly fixtures are used to glue the polymer side windows into place. The larger part of the windows is permanently joined to the exterior door skin for packaging reasons, while a segment of the lower area of the side windows can be opened. Finally, the reversing cameras are placed in their housings, and the e-mirrors that serve as digital door mirrors are mounted to the exterior CFRP of the door. In the context of quality assurance, all electronic control modules and their individual software and wire harness are checked. At the same time, the control modules are interconnected with the vehicle’s specific wire harness. Now, final startup of the XL1 is performed. First, the entire high-voltage system is checked. For this purpose, “simulated” isolation faults are introduced to test the system’s emergency shutoff functionality. The next step is to start up the internal combustion engine; all actuators and sensors of the TDI engine are checked, and parameter values at its first startup are compared to target values. In parallel, employees adjust the camera-based door mirror (e-Mirror); the correct visual field of the e-Mirror is optimally tuned using a special computer program. After all systems have been started up, a check is made of all electrical equipment; this too is done according to a precisely observed checklist. Only then is the production of the XL1 completed witha test drive to check dynamic vehicle functions. Now the world’s most efficient car can be delivered!